Hollow UPVC soffits have grown in popularity in the UK. 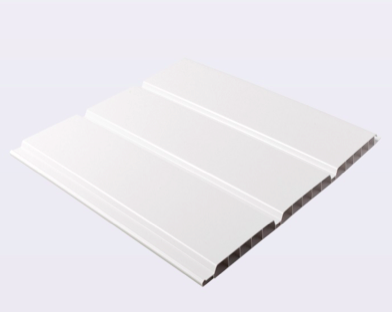 Many homeowners and installers prefer the appearance of a hollow soffit board thanks to the grooves running down the surface, which give it an attractive finish when the boards are cut into short lengths and installed at 90 degrees to the fascia. Hollow UPVC soffit boards can also make the installation easier for the installer, as the shorts lengths mean there is no scribing (shaping) when fixing the soffit to the wall. Hollow soffits can also be installed in their length and, whilst scribing to a wall that is not straight, there is no need to cut the board up into several short pieces, making it less labour intensive to fit. You will find full details on these soffits on our UPVC hollow soffit boards pages.